November 12, 2013 by Laurie 2 Comments This post may contain affiliate links, which means if you click on a link and purchase something, I may earn a small commission (at no additional cost to you.) See my disclosure policy HERE. 2. Decide how much you're going to spend on each person, and write that amount down next to their name on your list before shopping. Think about whether or not there are ways to make more inexpensive gifts for some people like a homemade gift, baked goods or consider a small gift wrapped up with a sweet note. 5. Choose how you'll shop. Using cash will definitely help maintain control of your spending over the holidays, however I know that can be difficult when so many deals are available online. If you shop online, put your budgeted amount into your checking account and use a debit card. If you absolutely are set on using a credit card, be sure to write down every single purchase on your list so that you don't over-spend. As we all know, those credit cards can be a HUGE budget buster! What other tips do you have on saving during the Christmas season? I'd love to hear your ideas, and I'll keep up with all the bargains over the holidays to help you pinch a few extra pennies this Christmas. July 25, 2013 by Laurie 12 Comments This post may contain affiliate links, which means if you click on a link and purchase something, I may earn a small commission (at no additional cost to you.) See my disclosure policy HERE. Have you ever had one of those days when you need to pinch a few pennies but just don't want to? I had one of those days yesterday at our house. My husband was working late, I took the kids out to run some errands, and every single ounce of me wanted to splurge and take them to their favorite Ice Cream Sundae bar . . . which even after a coupon would easily cost us $15-$20. But, we've been spending a lot lately. There have been extra activities that we've enjoyed this summer, we went on a huge vacation last month ago, are heading out on another short trip soon, my kids all are involved in several different sports, and back-to-school clothing shopping is just around the corner. After my husband looked over our budget last week, I knew it was time to reign things in. So, instead of a trip to Zen Beri (our family's ice cream place of choice right now), we made a stop at McDonald's and spent $4 on hot fudge sundaes ~ a savings of around $16 which is enough to stock up on quite a few school supplies if I shop wisely! It wasn't my favorite choice at all, but it was a better way to be a good steward of them money God has entrusted to us, and my kids handled it really well. Have you had to choose a more penny pinched route any time this summer? I'd love to hear how it's gone for you . . . it's so worth it in the long run and such an example for our children, but not always the easy choice! How’s Your Summer Savings Going? June 25, 2013 by Laurie 2 Comments This post may contain affiliate links, which means if you click on a link and purchase something, I may earn a small commission (at no additional cost to you.) See my disclosure policy HERE. One of my favorite PPP readers (and longtime friend) emailed me yesterday sharing where she's been at this summer as far as couponing. Oh my heavens I think we have all been there and I thought it was so refreshing to read her honest thoughts! Hopefully it will be motivating for you to hang in there too. So I wanted to tell you that I struggle with the couponing thing much like I struggle with other “hobbies”. I'm all in and organized and then I get behind, miss a sale, run out of printer ink, you get my drift and then it seems a million miles back, uphill. Confession time…I have not couponed this summer. The guilt piles on everyday and pushes me further from a homecoming like the prodigal son. Dramatic I know, but I'm reminding you how the female brain works or at least this female. I'm telling you I lost my way to tell you I found it again. (Also how we females like to stage confessions!) knowing last Friday that we were heading to the beach I had to watch the girls live in excitement while I lived in dread. I knew that I was facing a $300 grocery bill upon arrival because you need everything at the beach. Mid-day Friday I decided to return to my better self and have a plan. I went to Publix 72 with double batches of printable coupons (Earthfare 10/35 was a great start!) I had a thousand things on my to do list but this one was begging to make it a priority. I ended up with $200 worth of groceries for $27 including the raid on my pantry. I've included photos of our beach food BEFORE the Walmart run. I spent $100 at beach Walmart guilt free and can now enjoy this abundance of food without the black cloud of unplanned expenses. You CAN come back to the things you know to be true. Again and again! Thanks for what you do! Thank you Lana sooooo much for your sweet encouragement and reminder to us all not to give up! Do you have moments too where you struggle to keep up with couponing? Hopefully this will encourage you to stick with it, and know that even if you've “fallen off the wagon” for a week or too (or more . . ) it's not hopeless. I'd love to hear your thoughts! Saving For Vacation: Do You Have A Travel Budget? June 11, 2013 by Laurie 5 Comments This post may contain affiliate links, which means if you click on a link and purchase something, I may earn a small commission (at no additional cost to you.) See my disclosure policy HERE. There are tons of ways to save while you travel (my favorite is definitely packing a picnic lunch ~ that saves us nearly $30 every time we skip eating at a restaurant! ), but even if you pinch those pennies til they scream, no vacation is going to come free. So, figuring out ways to start saving for vacation has got to be your first goal before you plan your trip. Start early. Decide when you'd like to go, and try to prepare for your trip as much in advance as possible. We just got home last week, and I can guarantee you my husband has already started depositing money for next year's vacation. Determine how long you'd like to travel. Do you want to go for just a weekend, a week, or ten days? Decide exactly how long you'll be gone so that you can start correctly planning your budget. Figure out about how much you'll spend per night on hotels. (We usually figure $100-$150 including taxes and fees and typically stay at Hampton Inns because they offer free breakfast and are pretty consistent as far as their quality.) You may also find deals at websites like Kayak, Priceline or Travelocity, but we've not found many hotels well under $100 even on those sites. Decide how much budget you'll need for dining while you're traveling. We typically eat breakfast in the hotel if possible, have a picnic lunch if it's possible , and enjoy one “decent” meal out per day. For our family of five, our dinners can range from $25 (fast food) to $50 for a real meal, so definitely plan accordingly! Consider how much you'll want to spend on activities in the areas you're traveling to. We try as much as possible to go to places that are free (think parks, beaches, free factory tours), but sometimes there are special places we also want to visit. When we visited New York City, my husband really wanted to see the top of the Empire State Building, so (while I thought it was way too pricey!) we included that in the budget. If you're starting out summer like we are and can't imagine how to get started on saving for a trip this summer, start small! If you begin planning now and save just $50 a week on your grocery budget throughout the summer, you could save almost $500 by mid-August for a mini vacation. And, if there's really no extra room in your budget for traveling this summer, consider taking day trips and local biking or hiking trails that might be fun for your family. And remember, we are not all at the same place. My hubby and I have been married for(ever?) and have taken almost seventeen years to get to a place financially where we can afford to travel more often with our family. (And believe me, there's been quite a bit of penny pinching along the way!) But, if you do love to travel, look at ways to make it work for you, and determine to save ahead of the trip so that you don't come home to a credit card bill. I promise, you can do this! Do you have a travel budget in your family's monthly budget? I'd love to hear about how you save! March 28, 2013 by Laurie Leave a Comment This post may contain affiliate links, which means if you click on a link and purchase something, I may earn a small commission (at no additional cost to you.) See my disclosure policy HERE. How have you done this week on your budget? Has getting ready for Easter pushed you over your budget this week, or are you staying right on track? I'd love to know how budgeting looks in your home too, and if you have any tips for staying on track please leave a comment to share. March 14, 2013 by Laurie 9 Comments This post may contain affiliate links, which means if you click on a link and purchase something, I may earn a small commission (at no additional cost to you.) See my disclosure policy HERE. How's your grocery budget looking this week? We managed to stick to our budget this week, and it's amazing how good it feels to end our two week cash budget with a few extra dollars in my wallet. Success! February 28, 2013 by Laurie 8 Comments This post may contain affiliate links, which means if you click on a link and purchase something, I may earn a small commission (at no additional cost to you.) See my disclosure policy HERE. While we've done really well sticking to our grocery budget (we moved it up to $85 this January, and I think that's more than enough for our family), our dining out and miscellaneous expenses have been way over the last few weeks while we were traveling, and getting through two birthdays. Tomorrow begins our new “two week budget”, so my goal is to completely stick to the cash for all of our daily expenses over the next few weeks. Thankfully we have extra in our checking account when we go over, but it's so nice to stick to the budget! If you've don't have a budget for your family's regular expenses (groceries, eating out, entertainment, etc. ), I highly encourage you to get started. In our area of the country I know many folks are looking at possible job layoffs or furloughs, so sticking to a budget (whether you need to or not!) can really help those more difficult financial times become manageable. And, if your budget is really tight right now, I encourage you to hang in there to reach your financial goals . . . I know sometimes it's hard to stick to those financial goals, but you can do this and it is so worth it!!! 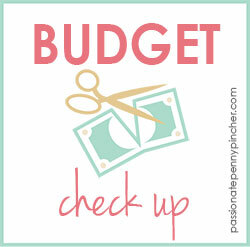 Grocery Budget Check Up Week 5: Still Sticking To Your Budget? 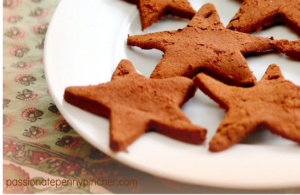 January 31, 2013 by Laurie 4 Comments This post may contain affiliate links, which means if you click on a link and purchase something, I may earn a small commission (at no additional cost to you.) See my disclosure policy HERE. The one thing that I was reminded of after that trip, was how very important it is to have an exact plan in place before getting into the grocery, and I highly recommend that (and wish I'd thought a little more prior to shopping.) Even though it was in our budget, adding last minute items to your cart can really hamper your penny pinching! However, this is the first month in quite awhile that we've stuck to our all-cash budget for groceries, miscellaneous expenses, and eating out, and I'm soooo excited about it, even if we did go over a bit this week. If you've been considering creating a budget for your family's groceries, this is a great time to start! And, if you have any tips on steering clear of those last minute splurges, I'd love to hear them . . . happy penny pinching! Grocery Budget Check Up Week 4: Do You Keep Track Of Your Spending? January 24, 2013 by Laurie 9 Comments This post may contain affiliate links, which means if you click on a link and purchase something, I may earn a small commission (at no additional cost to you.) See my disclosure policy HERE. How's your grocery budget looking this week? I really hope that you're focusing not only on pinching those pennies with all the great deals out there, but also keeping track of your spending. My friend Shannon and I taught a coupon class a few days ago, and I'm always amazed at how differently we look at shopping. Several folks in the class really just bought items as they needed them, not taking into account items that were even on sale . . . much less coupons. Even if you NEVER, EVER use a coupon, ALWAYS check the sales ad! I bet that 30-40% of my savings each week is simply by shopping what's on sale, and that really can impact your budget. Here are a few tips to help you reign in control over your budget if you're struggling with this one. Determine what you want to spend each week on groceries. Consider your family size, the amount of time you realistically have for bargain hunting and couponing, and what you’ve spent over the last three to six months on groceries. Also check out your pantry, take into account what items you’re stocked up on and which items are looking pretty slim, and determine your budget for the future. Remember that you can significantly impact your families financial situation by how much you spend at the grocery store, as the amount of money spent on groceries is one of the few items in your family’s budget that you have complete control over. If you need to change your grocery budget in 2013, this really is a great time to start, and I know you can do this. Determine today how you want your year to look, set realistic goals, and decide to take control of your finances instead of allowing them to control you. I can't wait to hear how you're doing on your goals, and am excited to see how we'll do in 2013 to pinch those pennies even further! 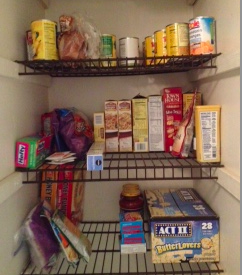 Grocery Budget Check Up Week 3: Are You Staying On Track? January 17, 2013 by Laurie 7 Comments This post may contain affiliate links, which means if you click on a link and purchase something, I may earn a small commission (at no additional cost to you.) See my disclosure policy HERE. How's your grocery budget looking this week? I know it's so easy to get excited in the New Year with tons of great intentions, but three weeks in those resolutions have all but bit the dust. However we're not quitting yet (do you hear me?) We can stick with our budgets throughout 2013 and reach our long term goals. We've really cut back on eating out over the last few weeks. 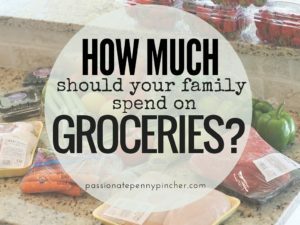 While our grocery budget has never been high, we had gotten in the habit of eating out as a family three times per week, which was just too much for our budget. We have a ton of easy food to make in the freezer, and I've been working to stay on top of menu planning, which helped us to stay under budget. When we do eat out, we've been mindful of how to spend less. Over the weekend we really wanted to go to one of our favorite Japanese restaurants, usually a huge budget bust for our family. We chose to go at lunchtime which saved a ton, all ordered water instead of soda, and used coupons (of course!) Our family of five had a huge meal for under $40 including tip, which is pretty reasonable for us! I've really stuck to my grocery budget while at the store, specifically by adding up how much I'm spending as I shop. Instead of just going in and grabbing any item on sale with a coupon, I've been much more conscious of exactly what my total is . . . that really does help so much! If you need to change your grocery budget in 2013, this really is a great time to start, and I know you can do this. I wish I could let you know how wonderful financial freedom feels (if you're not there already), because I promise it's worth pinching every single penny! Determine today how you want your year to look, set realistic goals, and decide to take control of your finances instead of allowing them to control you. I can't wait to hear how you're doing on your goals, and am excited to see how we'll do in 2013 to pinch those pennies even further. Share your goals by clicking HERE ~ I love hearing from you! 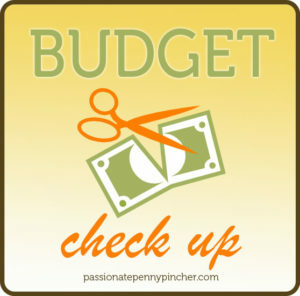 Budget Check Up Week Two: Have You Stuck To Your 2013 Grocery Budget? 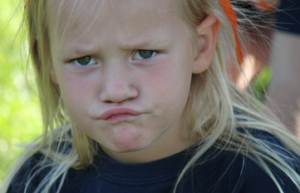 January 10, 2013 by Laurie 1 Comment This post may contain affiliate links, which means if you click on a link and purchase something, I may earn a small commission (at no additional cost to you.) See my disclosure policy HERE. Have you been keeping track of your grocery budget so far this year? I'm so excited, because we stayed within our budget this week for the first time in ages, despite a few kinks in our expenses. We typically take out a lump sum in cash every two weeks to cover groceries, dining out, and any “extra” expenses, including $85 that I budget for groceries each week. However, this week we enjoyed lunch with family that was a little more expensive than our regular restaurant meals, had a sick little girl at home (so $10 bought a new thermometer. . . ), and a local student was selling dining coupon books for $20 which I decided to buy. Needless to say, all that eeked out money from my grocery account! I was able though to use coupons at Publix to stay under budget, and my hubby and I even have enough leftover to enjoy lunch together (using coupons of course.) Success! After shopping today I realized our freezer is fully stocked, so hopefully next week that $85 will go towards lots of fresh produce at Sam's Club. (Their produce is so good, which is why I raised our budget a bit this year. It's a little more pricey than my stock up prices, but worth it because my family will choose fresh fruit over snack foods!) I love when we can eat from the pantry for dinner each night, and found at least 10 meals in my pantry and freezer that are ready to go. Woot! As you grocery shop, keep a running tally of how much you're spending. Over the last year I've become so lazy about this, as I just wanted to get whatever we needed and not have to worry about making an extra trip back to the store. I realized today though that by adding up how much I was spending as I shopped, I knew how much “extra” money I had to work with for to grab anything not on my list. Some days it's hard to bypass great deals to stick to your budget, but it really does help you reach your long term financial goals! Consider checking out your pantry and freezer for things you can make at home without spending any money. I was so surprised when I opened up my freezer to tons of veggies, make-ahead meals, and even meat that I'd completely forgotten about. I'm really going to work on using those items to make up our meals using what we have on hand, and also have enough “quick” food that there's no reason to head to the drive thru! If you need to change your grocery budget in 2013, this is the PERFECT time to start, and I promise, you. can. do. this. (really!) Determine today how you want your year to look, set realistic goals, and decide to take control of your finances instead of allowing them to control you. I can't wait to hear how you're doing on your goals, and am excited to see how we'll do in 2013 to pinch those pennies even further. You can share your goals by clicking HERE ~ I love hearing from you! 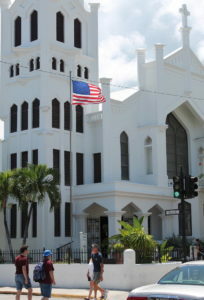 January 6, 2012 by Laurie 4 Comments This post may contain affiliate links, which means if you click on a link and purchase something, I may earn a small commission (at no additional cost to you.) See my disclosure policy HERE. 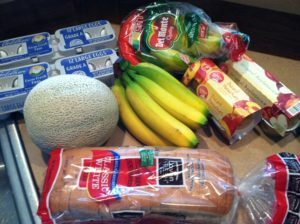 Here's week one of my grocery 2012 Grocery Budget Checkup. This week I shopped Kroger, Publix & Aldi (which is a lot of shopping for me, but I couldn't skip the Kroger deals this week!) This is what I purchased this week . . .
I’d love to hear how your grocery shopping trip went this week, and if you were able to purchase an item or two to give please take a minute to share that too! See how other folks are saving at Super Savings Saturday at Money Saving Mom,Weekly Totals at I Heart Publix, and Friday Finals at Southern Savers. Learn more about passionate giving, and interact with 7090+ Penny Pinchers on Facebook and Twitter, or subscribe toPassionate Penny Pincher by email.